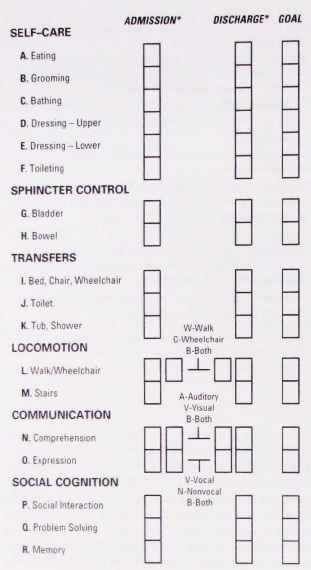 The FIM is used by health care practitioners to assess and grade the functional status of a person based on the level of assistance he or she requires. Grading categories range from total independence to total assistance. Irrespective of the use of any assistive device, the person is considered complete independence. The FIM measures what an individual can perform and not what that person could do under certain circumstances. Leave no blanks. Enter 1 if not testable due to risk. ↑ 1.0 1.1 1.2 1.3 1.4 Linacre JM, Heinemann JW, Wright BD, Granger CV, Hamilton BB. The structure and stability of the functional independence measure. Arch Phys Med Rehabil. 1994. 75: 127-132. ↑ 2.0 2.1 Heinemann AW, Linacre JM, Wright BD, Hamilton BB, Granger C. Relationships between impairment and physical disability as measured by the functional independence measure. Arch Phys Med Rehabil. 1993. 74: 566-573.